Commonly applied corn and soybean residual herbicides have the potential to injure cover crops planted after the herbicide application. Residual herbicides have activity in the soil for a period of time after application, and may remain active after the cash crop is harvested. A wide range of management choices (tillage, residue management, herbicide application rate, timing, method, and active ingredient), soil properties (soil moisture, temperature, pH, and organic matter) and environmental conditions (temperature and precipitation between herbicide application and cover crop establishment) can affect the residual properties of the herbicide. Cover crop injury will be dependent upon species sensitivity to the herbicide, application timing and rate, management choices, and environment conditions between herbicide application and cover crop establishment. Residual herbicide activity is often hard to predict prior to cover crop establishment and variable from one year to another. A crop is classified as a cover crop when no biomass is harvested. A cover crop becomes a forage crop when biomass is harvested for feed. A cover crop can be used for forage, however, most pesticide labels do not provide the plant back restriction time required from pesticide application to grazing or harvest for cover crops, only forage crops. If a cover crop will be planted later this cropping season, consider the rotational restrictions for any herbicides used in the field the past few seasons. Establishing a cover crop within this rotation restriction time period is allowed, however, the grower accepts a risk that the cover crop may not establish and will not be harvested for forage. In 2013 and 2014 University of Wisconsin-Madison evaluated several common corn and soybean residual herbicides’ impact on cover crops. The cover crops were established following silage harvest. All herbicides were applied at full-labeled rate and at the latest application timing. Results from this experiment indicate that risk of herbicide carryover injury is dependent on year, herbicide application rate, and cover crop species by herbicide combination. 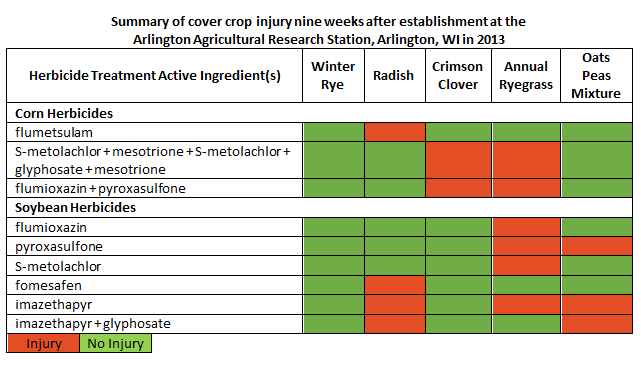 In 2014, little to no carryover injury was seen to any of the cover crops. More precipitation events and warmer temperatures in 2014 likely led to greater pesticide dissipation and degradation. Risk of herbicide injury is present when residual herbicides are used in the cropping system, however, weather conditions from herbicide application until cover crop establishment will influence when and if injury occurs. Research from several universities including University of Wisconsin-Madison has shown that winter rye is readily established following many residual herbicides used in corn and soybean cropping systems. Winter rye is one of the few cover crops that may be successfully established in Wisconsin following corn or soybean grain harvest. Following grain harvest there is often not enough growing degree units left to justify many of the other cover crop species- as little growth and benefit will occur.